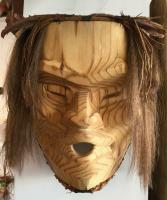 Carved from yellow cedar and detailed with human hair. 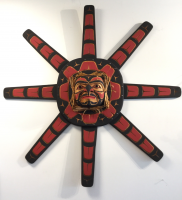 This phenomenal piece by the late Joe Peters was carved in 1987. 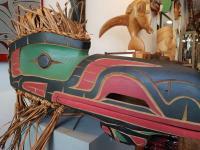 This incredible Crooked Beak of Heaven headress was one of Francis's early pieces and carved sometime in the mid - late seventies. It has long been in the private collection of the Hill family and has only recently been made available for purchase. 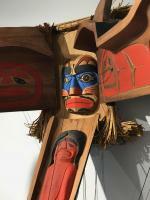 Carved from red cedar and detailed with acrylic paint, cedar bark and feathers.